Low Carb Crock Pot Lasagna Casserole - Recipes That Crock! 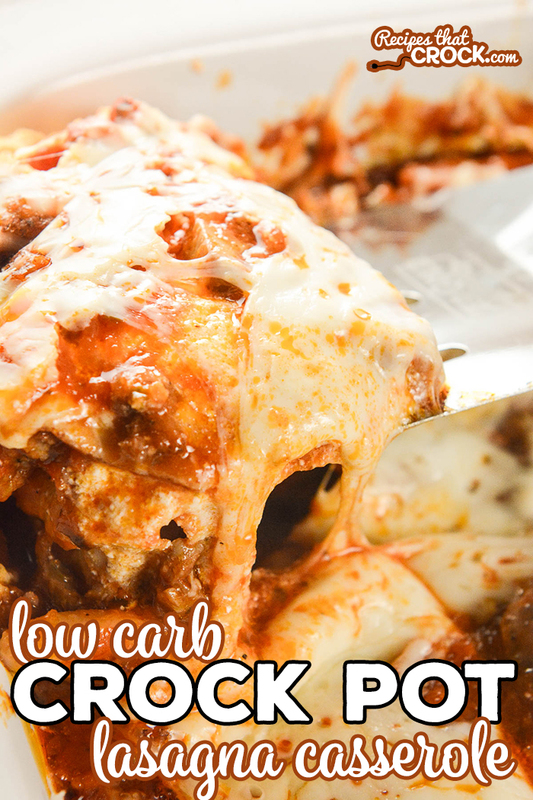 Are you looking for a low carb alternative to lasagna? 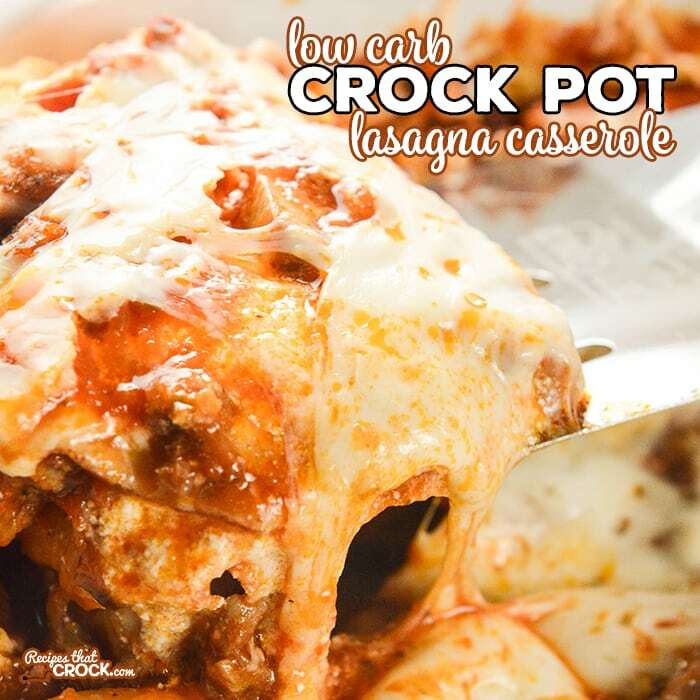 Our Low Carb Crock Pot Lasagna Casserole has all the flavors of your favorite dish with a fraction of the carbs! 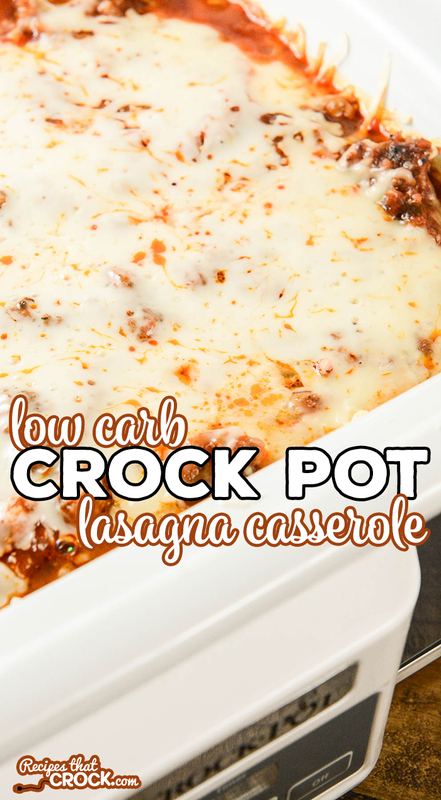 Our family loves this easy low carb crock pot recipe! My family has always been a BIG fan of lasagna. We LOVE the alternating cheesy and meaty layers. SO. GOOD. But, since going low carb, we have had to skip out on this favorite dish. That is until I saw an idea in Keto Comfort Foods. In the cookbook, she uses a special secret ingredient to help form layers in her BBQ Chicken Lasagna… it got me thinking I could do the same with one of our favorite lasagna recipes. And the results actually got cheers from my family. This is one that will be in regular rotation for a long time. 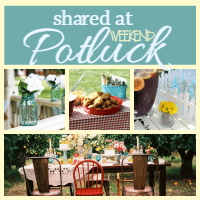 Psst… if you are looking for low carb recipes, here is a link to our full Crock Pot Low Carb Recipe Library that is updated weekly. This recipe uses an idea we adapted from one of our favorite low carb cookbooks: Keto Comfort Foods — seriously LOVE this book! If you are looking for other low carb recipes, you can find them all here. 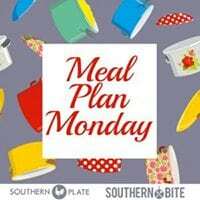 We used our casserole crock pot for this recipe, but you can use a traditional 6 quart slow cooker and get similar results. We have made this with 1 lb of sausage and again with 2 lbs. Choose how much sausage based on how meaty you would like your sauce. While this dish is yummy right after cooking, it will fall apart, much like a typical lasagna recipe. And, like traditional lasagnas, for best results, let the casserole cool for at least an hour to make it more sliceable. Setting overnight in the fridge after cooking will produce even better slices. Just slice and reheat in microwave. Combine marinara, sausage and mushrooms in a bowl. Spoon a couple spoonfuls of mixture into the bottom of a 6 quart or casserole crock pot and spread into very thin layer. Add 8 slices of chicken slices evenly and top with 6 slices of mozzarella. Add half of the meat sauce and evenly dollop dots of half the ricotta. Repeat the layers beginning with the chicken, then mozzarella slices, then meat sauce and ricotta. Top with mozzarella and cook on low for 2-3 hours or until cheese is melted and casserole is heated through. For best results, let the casserole cool for at least an hour to make it more sliceable. Setting overnight in the fridge after cooking will produce even better slices. Just slice and reheat in microwave. This recipe uses an idea we adapted from one of our favorite low carb cookbooks: Keto Comfort Foods -- seriously LOVE this book! Thanks Already have a lot picked out. We did the Air Fryer chicken with the CarbQuick the other day New favorite!! Made the low carb Pizza Soup the other day FABULOUS!!! WE are just getting started on low carb meals. I noticed on that one, you estimated the carbs at 3. Is there any place I’m not looking to see how many per recipe?? New to your site and can’t wait to try more. My wife’s picking them out as I go along!! Welcome to the low carb life! We always make our low carb dishes with the lowest carb products we can find, but we no longer post carb counts because products vary so much from region to region and we do not want to mislead anyone. Carb counts will always depend on the exact products and brands you use. If something is marked low carb on this site, it is because it is something I personally enjoy as a part of my low carb lifestyle. Hope that clears things up and I hope you and your wife enjoy the recipes! Low carb has been a game-changer for me and I am absolutely delighted to share with you guys the recipes that I love! Enjoy! Thank you so much for including all of these low carb recipes, tips and links to your other delicious choices. You are awesome! I can’t wait to try this. Yay. Thanks so much for letting us know you enjoy the low carb content! We love hearing that you guys are finding our content useful. So glad you enjoy the site and show. We have plans to add a video, but it will be a few weeks. I am sure it can be made in the oven, I just have not tested it. You will just need to cook it long enough to heat through and melt all the cheeses. Enjoy!